This place is clearing out fast. One day before Thanksgiving and the students here at Sac State are scattering off to home - where ever that may be this year. Primarily a commuter campus, many do not have far to go, but virtually all will be somewhere other than here. Most, undergraduate and graduate alike, are feeling the semester-end crunch. And most, like myself, will soon be enjoying one last day of freedom before school, with all its various and sundry deadlines, demands our full attention. This is the calm before the storm. As the homestretch rapidly approaches, there are now a few moments to reflect. This has been an interesting, frustrating, stimulating, eye-opening and exciting semester. It has been nothing like anything I have experienced before. It’s not just the rigors of being a student, college or otherwise. I have had that experience in spades, although grad school is like college on steroids. And it’s not the semester end crunch or the mind-expanding experience that education brings (again, super-sized, but the same). It’s a cultural difference. The relationship with my professors is far different than any I’ve had at any other level of education. Although we are not exactly peers, the student/professor dynamic feels more like that of indoctrination. They are preparing us. The time available for students and the interest they show in our progress is like nothing I’ve ever seen before. We are attempting to do what they have done and they are sincerely interested in our success. I have been told that our application process was rigorous; we were carefully vetted based upon our qualifications, yes, but also our desire, our aspirations and other perhaps intangible elements that led them to believe that we will make it. We have been adopted. It has been a productive day. Now 11:51 p.m., I am exhausted. There will be many more days like this in my immediate future. In fact, with the (possible) exception of Thanksgiving, every day for the next three weeks will be a struggle to keep my head above water. Yet the fight is not over and with each passing day, I am just a little bit closer to the end - as distant as it seems. I don’t want to keep saying the same thing day after day and I sure don’t want to appear as though I’m complaining, but nothing could have prepared me for what is currently expected of me. Except experience. After my first graduate semester is completed (and assuming I am invited back for another) I will have the needed experience to prepare me for what is to come, which is of course, more of the same. It will not be as daunting; I will have picked up some practice and knowledge along the way that will make the workload for the next and subsequent semesters feel much more manageable. Still overwhelming perhaps, but manageable. I know this, but it is of little comfort tonight. I still have a long way to go and little time to get there. I expect when it comes time to write my thesis in a couple of years (although the prep work will begin much sooner), I will again find myself in a similar position - wondering what I have gotten myself into. And again I will keep moving forward, sometimes blindly, until I reach an end - hopefully a Master of Arts degree. I am not sure I have ever dedicated so much of myself to a single purpose - certainly not where my education is concerned. Up until now, I didn’t have to - and that is not necessarily a good thing. Being “smart,” as I have been accused of more than once, is not enough to make it. Lots of smart people are working dead-end jobs, doing only what it takes to get by. I am not by nature a “go-getter.” I would much prefer to take the easier, softer way. Being able to apply minimal effort and excel can have a negative effect, one that makes taking shortcuts a way of life. For most of my undergraduate term papers, I could and usually did wait until a week or so before they were due before I'd start writing. It is certainly not the recommended way to approach these types of tasks, but I was always able to get away with it. Procrastination and I go way back. Although I knew that would not fly in grad school, I still put off some of the preliminary work, when I had the time, until now when I really don’t. I didn’t wait until the last minute, it was apparent early on that would not work, but I did not use good time management when I had the time to manage. Now, my time is being managed for me - it is virtually all dedicated to school. I have become painfully aware that it’s as it should be - I am not special. In fact, I have some catching up to do… I am not feeling particularly smart right now. The humility in that statement is palpable. I waffle between feeling like there is no possible way to make it to just seeing a glimmer of hope that I can. Today, when I finished reading, documenting, citing, reading some more and then writing a little, I realized I am a long way from home. A very long way. But it is calling me, as impossible as it all feels right now, tomorrow is a new day and with it brings new opportunity. A friend told me earlier this evening to just breathe… It’s probably the best advice I’ve heard in a week. This is, apparently, my place. 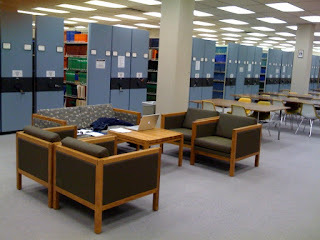 It is a wide aisle between the bound periodicals and the Masters theses, lower level, CSUS library. Amongst the pillars holding up this five-story (six if counting this basement) bastion of higher education are several “institutional” tables surrounded by equally institutional chairs. About midway is my place; a little island of quasi-comfort with a small square coffee table surrounded on opposite sides by four indestructible armchairs with an almost matching love seat between them. On the pillar to my left is an outlet to plug in my MacBook Pro for, even with a freshly charged battery good for upwards of three hours, I will outlast it. I grew up with some notions… about what this is and what that is, about what things are and are not. By the time I entered junior high school, I had been introduced to “social science.” As my education advanced into high school, the social science courses narrowed in scope going from simply “Social Studies” to more specific areas within the discipline. Concurrently, courses in other sciences were also required. Mathematics, chemistry, biology, physics and the like were what I came to believe science was really all about. Eventually I became aware that there is a continuum; on one end are the “hard” sciences like physics and on the other were the “soft” sciences… the social sciences. I grew up in a world that was dominated by numbers. My father has a Ph.D. in chemistry from Stanford University - among the hardest of the hard sciences and from one of the most prestigious schools in the world. Logic and numbers reigned king; any science worthy of wearing the badge had to have some form of measurement that produced empirical data. It had to be quantifiable. Something had to be counted. It’s not as though I was beat over the head with this pedagogy, it’s just the world that made sense to me. And I took to it. I was a whiz at math and excelled in other science courses as well - all while carrying a distinct disdain for school and education in general. My baseless dislike for social science continued for many years. It’s not that it dominated my every waking moment, but the backdrop always remained - how could it be science if there isn’t an answer. Sure, hard sciences are driven by hypothesis and theory (a theory, in scientific terms, is supported by enough evidence that it is considered a fact until disproved), but even when the “answer” is unknown - it is knowable. That is, with the proper data, it is possible to know the answer empirically. There is no way to ever know for sure why people behave the way they do, what “love” is or the existence of God, for example. So what are numbers anyway? They are nothing unless associated with a thing. They represent only quantity and say nothing about quality. If I have two things and put them together with two more things, I’ll have four things. True yesterday, true today and true tomorrow. Two plus two always equals four. But what if I have two apples and put them together with two oranges? I still have four things, but the number itself says nothing about those things… for that we need more than just numbers - we need words. Communication studies are absolutely toward the soft side of the science continuum. Indeed, the degrees offered in Communication Studies at CSUS, BA and MA, lack the trailing “S” denoting “science.” I am working on a Master of Arts degree - and I never even gave any thought to the fact that I am studying to be a social scientist. But it’s even more ironic than that; I am leaning toward the qualitative end of the segment of the spectrum that is already on the “soft” side of the science continuum. I have turned a complete 180 and never even saw it coming. I gravitated towards qualitative reasoning over quantitative counting despite thinking I was built to think otherwise. Communication studies employ a number of quantitative methods and processes, research that requires statistical manipulation of empirical data. But on the qualitative side there is observation, reporting and an attempt to draw parallels to universal understanding. So today, while working on this quantitative research paper, I am ever observant - from my little island in the basement of the CSUS library. It seems to be what I do. I have barely moved for more than six hours. From this “institutional” couch in the basement of the CSUS library, to the printer and back again, it has been my entire existence from late morning, all afternoon and now into the early evening. I am taking a break. The reading, the culling, the discarding, the organizing and even a little bit of the writing that will comprise one of two papers has moved significantly forward and yet the cold reality is there remains far more to do than has been done. Nevertheless, it has been a very productive day. Tomorrow promises more of the same. Actually, tonight does as well; it will just be in the more comfortable (and distracting) environment that is my home. Soon I’ll be on my way to a little food, a little rest and not enough relaxation. After socializing briefly with a few friends later on, it’s back home and back to the grind. It will be a long two or three weeks, but at least I have moved large mountains of research today. The light, though still dim, is getting brighter. I doubt very much anyone will hear me complaining about the lengthy break between semesters this year. When I got to the library this morning, I had little to no motivation. I didn’t want to read (not the stuff I have to anyway) and I didn’t want to write (again, not the stuff I have to). I opened my MacBook Pro and went to my blog, checked in on my bank account and… stalled. Finally I decided to write what I would advise someone else who was having trouble getting started, something I have recently advised a friend going through what I am now. The words rolled around in my head, they began to take their places on the unwritten page... They started to talk to me. Just like that? Well, yes and no. For some, for myself many times, "just start writing" means start writing something, anything. But not this time - that old familiar mantra wasn’t prodding me to write just anything and it wasn’t prodding me to write this stuff, as much as I tried to spin it that way. This time, there was something specific and I knew it. I just didn’t know where to start. There it was again, as clear as ever. I closed FireFox, closed my email and opened up a Word document and I just started to write. It was not flowing well at all, but I kept writing. I wasn’t sure where I was going, but I kept writing. After a potential abstract was cobbled together, I was granted a little bit of clarity and the next several hours were not spent writing at all. Ok, that’s not exactly true, but I don’t exactly count documenting my references in APA format writing. But it is a key and integral part of the process, a time-consuming but necessary component that is no more inclined to write itself than anything else is. My reward is now this. Writing the stuff I like to write. Learning, sometimes lessons over again, from being a self-aware being. Language separates us from every other known living thing. Words are ours and ours alone. Putting them together in an order that makes any sense at all is not only not easy, it is virtually impossible. Yet we, as a species, do it in our sleep. And then sometimes the words just won’t come. I have, however, justified it. Rather than open up the can of words that is either of the two term papers I have to do (due less than a month from now), I have convinced myself that there isn’t sufficient time left tonight to set up, make any significant progress toward an end I cannot yet visualize and come to some logical stopping point, only to put it all away. No, far easier to create straight from my skull than to assemble the thoughts, research and conclusions of others. Of course there is a creative element in this work as well, but only after extensively examining what others have done first. It is a daunting task, but there is yet time and tomorrow I have nothing scheduled except research. It was a gloriously warm and sunny autumn day in Sacramento today, much too nice to get inside a car. 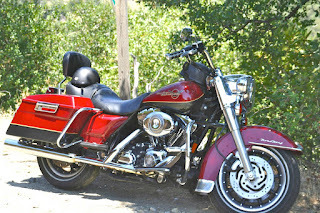 I logged many miles on my Harley, going some places I had to go and a few that I didn’t. When riding, be it solo, with friends or in a pack, there is a certain solitude that frees my soul. My mind is unbounded; it is able to discover and rediscover. I am able to find clarity in my challenges and conflicts, academic or otherwise. Although my rationalization to put aside the necessary work I must do is based on insufficient time, that deficiency is artificial. The time was always there, but I wasn’t. I was riding my motorcycle. And maybe that makes the justification justifiable. Perhaps these are among the necessary steps I must take to release myself from the daily grind. Not that my days are routine or monotonous by any means, but more in terms of the physical sensation of living life at the speed limit - and I’m not referring to miles per hour. Rather, it is the conformity, the rigor and the norm that sometimes leaves everyday life feeling like just that. As day turned to dusk and dusk turned to night, the temperature dropped rapidly. First in just my shirt and jeans, then came my jacket, chaps to cover my pants and eventually I broke out my face mask. As the temperature decreased, clarity increased… mind, body and spirit slowly became one. By the time I arrived home, I felt it. I had planned tonight to do some of the work still pending for the completion of my first graduate semester. This is not it, but in a sense - it is. At least the ride that led up to these words was. Meditation can mean many things and come in many forms; sitting atop 750 pounds of steel, chrome and rubber… controlling where it goes and how fast it gets there does it for me. It is the freedom that creates the words. These words, those words… any words. Tomorrow I will most likely drive my car. I will be in the library early and stay there most of the day. Today the words rolled through my head as I rode - tomorrow the road will inspire the words I write. I have been here before. In a physical sense, on this couch and in front of this iBook G4, many times - often, regularly and recently. Wanting to… no, needing to write something and not just anything. Oh, yes… again often, regularly and recently. And of course, at the same time, not wanting to do the kind of writing I must complete before this semester ends. This is nothing new. Even that acute sense of urgency that is growing by the day is a re-run of sorts. And although my immediate (not long-term) emotional status has taken a turn for the worse, it, too, is not unfamiliar ground. But at least in this last respect, the often, regular and recent qualifiers can be dropped. The nearly five-month relationship I have been involved in has come to an end. I don’t want to get into the “he said/she said” of it all, but I was the one who broke it off. I don’t want to write about it; I was trying not to, but this is where the words are leading me. It had to do with a difference of perception and it has become abundantly apparent to me that the chasm is too wide and too deep to be bridged. It has been an underlying issue from the beginning and although successfully ignored for periods of time, it never went away. Love might make the world go around, but it is not enough to maintain a successful relationship. I have been here before, but this time it’s different. Time has passed, experience has been acquired, wisdom has been gained. The right way is often not the easy way while the easy way becomes so much harder – eventually. I am almost 46 – maybe I have finally started to grow up. Perhaps this is one of those lessons in life that has eluded me all of these years. Is it possible that I have finally learned to sacrifice instant gratification for a long-term serenity? I don’t presume to know the answer, but I can say that in the moment, this very moment, it is not easy. Will I make it? My network of friends and my family are convinced I will. I wish I were as confident. I have become accustomed to doing what it takes for long-term results, sacrificing instant gratification for the lasting rewards of persistent effort. Although it might seem odd to apply the same paradigm to interpersonal relationships, the parallels are there and moreover, the different facets of life - of my life – are inseparable. It took a long time to learn one of life's basic lessons - not only is it not easy, it’s not supposed to be. And right now it's not easy, but I’ve been here before. This time I have the fortitude it takes to let go, move on and be grateful for all that was and all that will be. This slogan is most often associated with motorcycles - Harley Davidsons to be specific. The enamel pin on the right is a Wm Spear Designs take-off of another popular motorcycle phrase, "Ride hard, die free." Both have had an eerie resonance with me for most of my life – certainly all of my adult life. Are the two sides of the equation related? 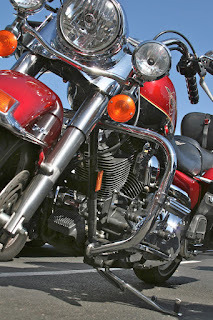 Does riding or writing hard equate freedom? Does doing anything with conviction, commitment or enthusiasm garner one some sense of freedom? Has it got anything to do with work; with sacrifice; with blood, sweat and tears? Indeed, freedom of any approximation seems to require some scale upon which its value can be measured – work. And perhaps that is part of the problem in our nation today. Too many are out for the quick fix, the fast buck… for instant gratification. The paradox of instant gratification is that it only lasts for an instant. The rewards of hard work are lasting, they’re deep and they are mine. I no longer desire instant riches – hitting the lottery appeals to me only inasmuch as how much more I could do with that kind of money – how much more work I could produce. And that’s what it’s really all about. I mean, what else are we here for? To only consume? To just take and take and take? I have found through the trials of life, by the good, the bad and the ugly, that freedom cannot be given away, sold or purchased. It is not a birthright - here or anywhere else. It is gained only through work – hard work. It could result in something tangible, but often it is the unspoken, unwritten and the indescribable that means more than anything that could be held in one's hand. It could be expressed by riding or writing, but one way or another, freedom is earned and should never be taken for granted. Written in October 2007, this post from "Home of the Free" is just as relevant in 2008. Christmas is nearly upon us once again. Many would call it the undisputed heavyweight champion of all contemporary holidays. It has it all - decorations, presents, a grand meal, family tradition, a religious origin, symbolic icons, parades, music and extreme commercialism. And like only a handful of other holidays, it has an “-eve” to welcome its arrival. It even has its very own season with its very own greeting... "Season's Greetings." Yes, Christmas might just represent the pinnacle of what every holiday aspires to be. Which means that all other holidays are lacking by comparison. Where’s the justice? Why should some holidays receive all the glory while others deserve only a footnote on the calendar? There are other holidays that have religious overtones, perhaps even more so than Christmas. Take Easter, for instance. Not just one day, but actually three starting on Thursday night, through Good Friday (aren't all Fridays good?) and ending on the evening of Easter Sunday. Talk about holiday potential! Instead of one day, there are three solid days for gift giving, parties and festivities. Imagine the commercial build-up. Imagine the spectacle. Throw in a Monday and it can't lose. But no, all we get is a cheesy bunny. He somehow lays multi-colored eggs and then cleverly hides them. If we’re lucky, he pushes out - I don’t want to know from where - some that are made of chocolate and puts them and other candy in a basket with plastic grass that gets everywhere. And speaking of candy, what about Halloween? Here’s a holiday that’s not a holiday. There are the parties, sure… and decorations galore, but there has never been a day off. An included day off really is a must for any self-respecting holiday. There are holidays better known by the dates they fall on like the Fourth of July or, hijacked from our neighbors to the south, Cinco de Mayo. Then there are the “Monday” holidays. These are the holidays that are on one day, but “observed” on another. In 1971, the Uniform Monday Holiday Act moved Veterans Day, Memorial Day and George Washington’s Birthday (before it was given an identity crisis by combining it with Lincoln’s Birthday into “Presidents Day”) from their original date to a convenient Monday so federal employees would have more three-day weekends. The act also created Columbus Day, the dumbest holiday of all time - glorifying a wayward sailor who got lost and discovered… India. No. America. No - India. No, ok, America, but let’s call the people there Indians. Oddly enough, there is no Indian or Native American Day. It wasn’t a “new” world to them, they knew it was here all along. After protests by veterans groups, in 1978 Veteran’s Day was moved back to its original November 11th date. The vets felt it had lost its importance and had become nothing more than just another three-day weekend. Well then, let’s move on to some of the more innocuous holidays. In no particular order and with no particular importance, some of the most pointless are: Groundhog Day, Flag Day, the afore mentioned Presidents Day, Pioneer Day, Patriot’s Day, Valentine’s Day, Saint Patrick’s Day, and the ever-popular Grandparent’s Day. And just when you thought it couldn’t get any worse, here are some of the “unofficial” holidays created to commemorate God knows what: Bloomsday, Buy Nothing Day, Friendship Day, Husband Appreciation Day, Wife Appreciation Day, International Talk Like a Pirate Day, International Kitchen Garden Day, Mole Day, Monkey Day, National Gorilla Day and a day that needs no description - No Pants Day. That must be why adults need so many damned holidays. It's a good day to be an American. There has been much said and there is so much more to say, but for now that is enough. I cannot talk and write at the same time. Nevertheless, the point of the piece is still relevant. Furthermore, with the passing of several days, the premise has had time to evolve. At this time on Tuesday morning, I am usually getting ready to go to school. I have office hours beginning at 12:30 and lecture at 1:30 - I don’t usually have to be out of bed before 10 a.m. Brutal, I know, but it does underscore one way in which I choose to spend at least some of my free time - sleeping. My hours are not regular and I am often up late… I sleep when I can. Today, however, is not a normal day (actually, no day ever really is; a post for another time, perhaps). It is Election Day. My two youngest sons registered and are voting in their first elections ever. They have not been oblivious to what has been going on in the world around them. Their awareness of the political landscape has surprised and amazed me. I am, of course, extremely proud. At 21 and 19 years old, the current administration has been in power for much of their young lives and long enough that they likely have no real contextual recollection of any other. It is time for that to change - the past eight years have been a good example of a bad example and for having little to compare it to - my boys recognize that things could be better - much better. This time, it’s about so much more than exercising one’s right to vote. This time it really does matter. This time, the regular and peaceful change of leadership is a silent revolution. The good ole boys have led us down a perilous path and it’s time for someone to set us straight. It’s time for someone to say enough is enough. It’s good to know that Americans will not be pushed around - obviously not by terrorists or by other countries, but especially not by those elected to serve us. For this, I’ll take the time - anytime. The following was originally posted on "Been Some Places, Seen Some Things," one of my alternative blogs, on November12, 2006 - nearly two years ago. This time of year brings back many memories and as I am not averse to plagiarizing myself, here it is again - as profound as ever. Another day just came to an end. It was a good day. Most are lately. Yesterday I visited a friend who is currently residing in the same hospital that I called home for several weeks six years ago. Although my experience there was miraculous, insightful, enlightening, transforming and a host of other equally profound adjectives, there were no good days. Not a single one, not even the day I left. It took some time and a lot of pain before the days got to be even close to good, but here I am today nonetheless better – a lot better than I’ve ever been. In many respects, my friend is in the same boat I was in. The specific nature of the medical condition that led to her hospitalization is different; so too is the magnitude of her condition. However, the fear, the uncertainty and the helplessness are no different. I’ve been there. It was hard for me to walk back into that institution. It always is. I never particularly took to hospitals in the first place and my extended stay in one sure didn’t change that. Much had changed in just the 18 months or so since I had last been there. I was visiting a different friend. I have always made it a point to visit the ER/ICU when I’m there. Although my memory is fuzzy, there are a few nurses there that I remember and they remember me. They see a lot of patients come and go and many that go… well they go permanently. It’s the nature of a trauma center; you don’t end up there if you’re not in pretty bad shape. I was expected to be one of those that left in a permanent fashion. That I didn’t, and have since been back, willingly and under my own power, is (or was 18 months ago) still a source of amazement to my caregivers. Like many hospitals, Washoe Medical Center, in Reno, is expanding. Indeed it seems it always is. There has been construction going on every time I’ve been there, whether my stay was a few hours or a few weeks. The floor my friend is on is the same floor I was on after they moved me out of ICU. It’s also where my other friend was 18 months ago. It used to be called the “step-down” unit and it was on the third floor. Now that ward – with my old room - is the oncology unit. I’m not quite sure why my friend is in that unit, she hasn’t got cancer – my other friend did, and he has since passed. This time, however, there has been much more extensive activity than just the rearrangement of furniture. Everything is different, including the ER/ICU. They even changed the name of the whole hospital. New graphics, slogans, color scheme… and, it would appear, new personnel. At least that is what I was told by the administrator behind the “admitting” desk in what used to be an old, “throw-back” style ER waiting room. There used to be a door under the TV with a phone hanging next to it. In the past I would simply pick up the receiver and wait for an answer. “What can I do for you?” the friendly voice on the other side would ask. “I was just wondering if there is anyone working today that was here during that period of time?” was my typical response. Usually I wouldn’t even get put on hold, “Hang on just a sec… Peggy? You were here at the end of 2000, weren’t you? Do you remember a Mike… what was your last name?" By this time there is some kind of surprised exclamation followed by the door being buzzed open. “Come on back!” And I hang up the phone and push the door open. “Really?” But 18 months ago there would be - was. I suppose she was just doing her job. I asked if I could just walk back and see if I recognized any of the nurses. She asked me if I had a name of someone– I didn’t, and no she wasn’t going to just let me walk back there. There was not much else I could do. I am relatively sure there were some still there from when I was, but the admitting “nurse” (she isn’t a nurse, but they all dress like one), was equally sure there weren’t. It was a losing battle and perhaps the finality I needed. That place was special. My stay was short, but in terms of hospitalizations, pretty lengthy. Considering my days there were 24 hours long, it felt much longer. I have made this informal and irregular pilgrimage since I left the mountains four years ago. I can’t really explain any better than to say that it was a part of me. I wanted to express my gratitude again and tell those who took care of me that their efforts were not in vain – that it was worth it and that I care a great deal. Maybe that administrative assistant was right. Maybe all from that era are gone. Perhaps it’s time now to close that chapter in my book. Time and change are constant. Thanks in large part to the efforts of those kind and caring professionals, I am living proof. Knifong, Donna. (2000). An Interpretive Journey of Maya Angelou’s Poem "On the Pulse of Morning." Unpublished master's thesis. California State University, Sacramento. Knifong’s rhetorical criticism of Angelou’s poem, “On the Pulse of Morning,” comes from a self-admitted place of deep admiration for the poet and her work, especially for the poem in question. Written for the 1993 inauguration of President Clinton, Knifong relates how she was “absolutely spellbound … and left irrevocably affected” upon hearing Angelou’s recital. This adulation might lead one to expect nothing more than glowing accolades of the brilliance of this acclaimed poet. Although this assumption would not leave the reader disappointed, Knifong’s analysis goes well beyond just a positive literary review. In fact, she actually writes it twice - first for the masses in a way that could be appreciated by those outside the realm of academia and once with an extensive literature review and scholarly citations. But Knifong’s break with traditional scholarly writing goes much deeper than the inclusion of a popular interpretation. Although meeting the definition of rhetorical criticism, as cited in her thesis, Knifong places herself into her writing - and Angelou’s. Throughout her thesis are personal reflections of where she was, what was going on in the world around her and how the words made her feel. In a very real sense, this criticism is part ethnography and as such, Knifong has taken the literary liberties this method enjoys. This freedom of organization is perhaps most apparent in the first section where her analysis is primarily an exploration of the poem by verse, by line and sometimes focused on just a single word. Although Knifong’s observations are often backed by attribution, it is not scholarly citation, but rather blended into the prose so the flow of her interpretation is not interrupted. Even her second section, written under the constrictions that scholarly work demands, takes on a much more personal touch. Written almost entirely in the first person, Knifong’s work takes the reader on a journey, citing what many others have written along the way. This is not a re-written first section with citations thrown in as appropriate, but rather an expansion of her insights and an exploration through the eyes of other scholars. Her last section invites the reader into the process that developed the final work and the revelations that emanated from it. It, too, adds to the overall robustness of this work. I’m afraid I have waited much too long. It’s never going to be just perfect; it’s never going to come to me all at once. The words, like any other work of art, must still be blended, contrasted and arranged. The inspiration is never accompanied by composition. I have confused profundity and inspiration with creation… I have been waiting for something that will never arrive. It can’t be delivered or received - it is not yet created. It would be nothing to take a thought, an idea, or a truth of universal proportions and simply transpose. If the answers to all the big questions of mankind were delivered directly into my skull, would I be any the wiser? Of what value would that be? No toil, no struggle, no questioning the clarity and rhythm of the words… just a simple recording of something in my head? Worthless. The process, stoked by inspired madness gives birth to the words that must then be nurtured to maturity. The library is not a quiet place. There are sounds everywhere. Hushed whispers, the shuffling of feet, the rustling pages filled with words written and the ever-present droning of the escalator on its endless journey - all provide texture to what the words will become. It is Saturday, just before closing. Rain has been falling for most of the day. Inside the library a cool, moist freshness permeates the nearly abandoned building. And the escalator never stops. Life is a constant journey of discovery and rediscovery. Learning from words past and experiences present. Like the escalator, often it drones on and on. People get on, people get off and the escalator keeps climbing, sometimes for hours in solitude, just waiting. Another experience, another piece of a never ending puzzle… a picture never fully formed and never completely finished, the words are kept here. My experiences reflected in words will form the experience of others and they, too, will contribute their words to the mosaic that will never be complete. The messages come from nowhere and everywhere, from no one and everyone. They come to me and they come for me, beckoning me to create. Yet I resist, waiting for more, waiting for the framework or, better yet, the completed. It will not; it cannot. It can only be formed here, right now. These words are created within this library, on this rainy day, amongst these books and next to this escalator. There could be no other way.